Abuja (AFP) - Six Nigerian pilgrims were among 107 killed when a crane collapsed at Mecca's Grand Mosque in Saudi Arabia at the weekend, a spokesman for the National Hajj Commission of Nigeria said Monday. "So far, we have lost six pilgrims -- two males and four females while we have three injuries," Uba Mana told AFP, adding that the death toll could rise further. "We can't say this is the final death toll because the situation is still unfolding. We are still visiting the hospitals and mortuaries in search of more casualties from Nigeria," he said. Mana said some 58,000 Nigerians were already in Saudi Arabia for the Hajj out of 76,000 expected for this year's pilgrimage. "The rest will be airlifted in the coming days," he said. President Muhammadu Buhari on Monday sent "his heartfelt condolences to the families, relations and friends of the Nigerian victims of the crane accident", his office said in a statement. It said Buhari urged "Nigerians to join him in praying for the quick and full recovery" of those injured in the incident. 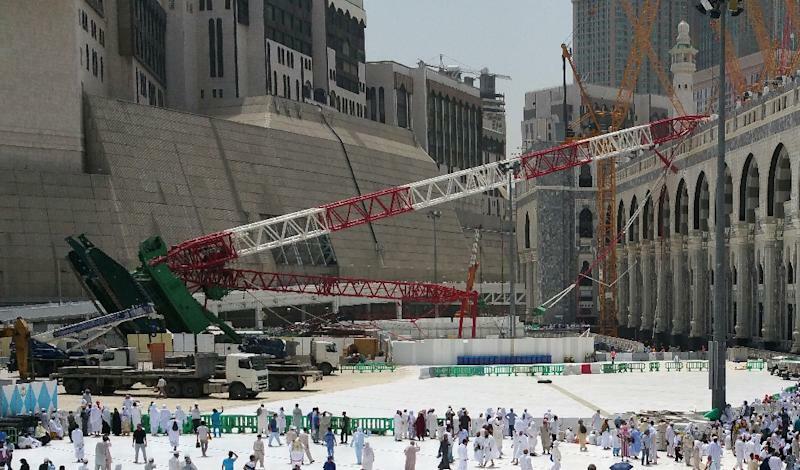 The crane which collapsed on Friday during a thunderstorm with extremely high winds was one of several working on a multi-billion-dollar expansion of the mosque to accommodate mounting numbers of faithful.